Have an Olympics hangover? Looking for something to do this week to fill the void of your new obsession over snow-sports? 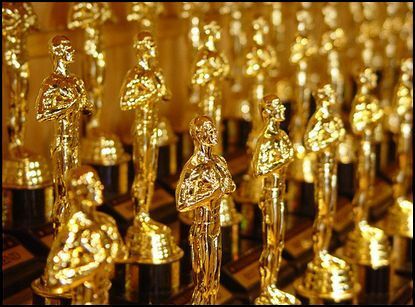 Channel your energy on planning an Oscar-viewing party for this Sunday, March 7th. Here are some tips, inspired by the nominated films and actors, to get you started! · Inspired by “Up,” which is nominated for Best Picture, tie a bunch of balloons to a gingerbread house. · Give props to “District 9” by channeling your inner extraterrestrial with alien-themed candy. · Blue cocktails are a must for “Avatar” fans. Bonus points for guests who come in blue full-body paint! · For a different spin on the movie “An Education,” create an interactive learning station with a new food or beverage. From a buffet of different cheeses to whiskeys, the possibilities are endless. · While “Julie & Julia,” didn’t get a Best Picture nod, Meryl Streep is up for Best Actress. Celebrate this picture with some signature Julia Child recipes. Tomorrow I'll have some awesome tips from around the blog-o-sphere!